A great mint, although it has a much milder mint taste due to the green tea. Not much sugar in these, but not sugar free either. Nice that it has Matcha Tea as part of the ingredients. 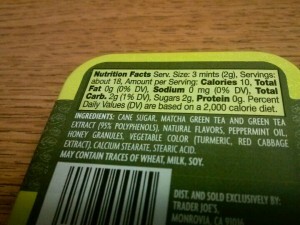 Each mint has about 3 calories, and the container lists the serving size as THREE mints. 2g sugar in three mints is not too bad. 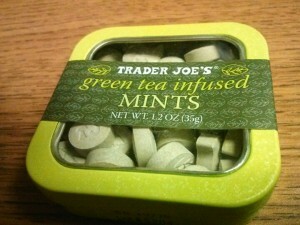 If you like to freak out about sugar content, then this may not be the Trader Joe’s mints for you. Caffeine is not listed, so we will assume there is minimal, or no, caffeine. Total mints in the can: 3 x 18 , or about 54 mints.